This article is about the character. For the guest star, see Tina Fey. Tina Fey is an author. 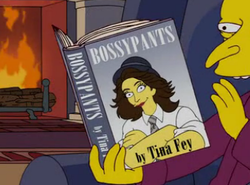 She wrote the book Bossypants, which Mr. Burns was reading. The book, Bossypants, is an actual book that Tina Fey wrote. Modified on September 6, 2012, at 13:07.